Paola & Robert Pizzano were honored at the commemoration of the Joey Pizzano Memorial Fund’s 20th Anniversary. 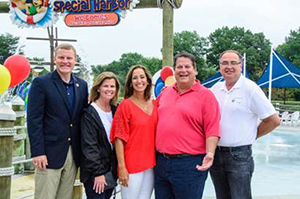 The JPMF Family Fun Day marked the season finale at the popular Our Special Harbor sprayground! Special appreciation is extended to each of these donors for enriching YOUR Fairfax County parks! Hilltop Sand and Gravel Company, Inc.
J. Warren and Catherine Rice Gorrell, Jr.
Kenton R. and Diane G. Miller, Jr.
James B. and Rosemary A. Tapp, Jr.
Rick A. and Mary Lee Montfort, Jr.
H. Lee and Lisa Einsel, Jr.
William S. and Maryann Fennell, Jr.
James C. and Chris McGlone, Ph.D.
William R. and Katherine D. Richardson, Jr.
Charles C. and Maureen O. Viall, Jr.
John M. and Patricia L. Wilson, Jr.
John F. and Mary K. Crossin, Jr.
Charles R. and Ellen S. Haberlein, Jr. Page L. and Agnes S. Hite, Jr.
Daniel C. and Mary Ellen F. Hurley, Jr.
William E. and Janice J. Kinsella, Jr.
Robert and Phyllis W. Kobel, Jr.
A. Warner and Virginia Robins, Jr.
James P. and Katherine S. Thompson, Jr.